The Runoff Processes module offers a thorough introduction to the runoff processes critical for flood and water supply prediction. Through the use of rich illustrations, animations, and interactions, this module explains key terminology and concepts including paths to runoff, basin and soil properties and runoff modeling. It also provides an introduction to the National Weather Service River Forecast System (NWSRFS). As a foundation topic for the Basic Hydrologic Science course, this module may be taken on its own or used as a supporting topic to provide factual scientific information to students as they complete the case-based forecasting modules. 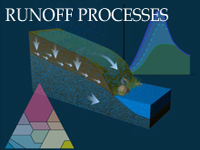 Great overview of runoff processes. May be a little dated depending on what you're doing, but overall excellent course! A great refresher of runoff process terminology with visual referencing. Very helpful! Clear and to-the-point. It is my first time to read about Runoff processes, the module learning curve is moderate, not too steep. I have learned too many thing in a very short time, which is amazing. I recommend to have more model exercises. Excellent portrayal of hydrologic principles. It is very useful. I recommend you to try this. Take this module. It would be very helpful for you to understand better things. outstanding graphics, well organized ideas and even interesting and exciting quizzes! I highly recommend it. This module was very informative and enjoyable. It went into detail just enough to let you know how they figure out the different models, But not too much. I learned a lot from this Module. I enjoyed this module from introduction to quiz. The graphics were accurate and timely. It went into depth on specific runoff processes just enough to get the most important aspects out of it; while not dragging on too long on details that can sometimes destroy the pacing of a good module. The terminology and concepts covered were easily drawn from my mind during quiz time... which in the end is a satisfying experience. The concepts of runoff generation in this module remain relevant and useful (section 1-4). Sections 5-6 on modeling and the NWS River Forecast System are dated and don't reflect changes since the module's publication in 2006.